Offer expires January 07, 2013 11:59pm (EDT). Please call 1-800-852-4216 for complete details. 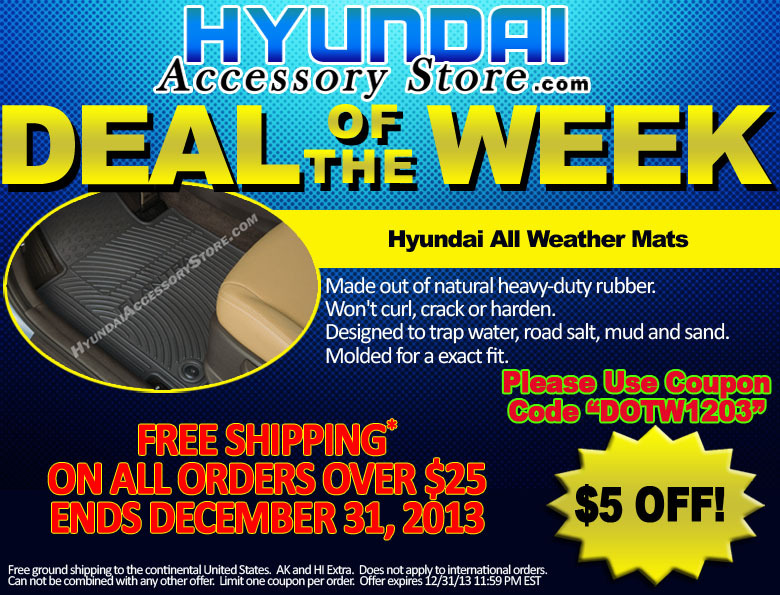 This entry was posted in Hyundai, Hyundai Accessory Store, Hyundai Motor America on December 31, 2013 by hasblog. The patented Digital Power Station™ analyzes the audio signal in real time and digitally optimizes it for playback in your vehicle’s acoustic environment. It extends the frequency response of the speakers and maximizes the frequency-specific power distribution of your head-unit’s amplifier. All vehicles have unique acoustic properties such as speaker placement and passenger compartment design. Bongiovi Acoustics engineers use these characteristics to provide the optimum listening experience. The Bongiovi Acoustics Digital Power Station™ processing power produces rich, full sound and also compensates for any inherent volume differences that may exist between audio sources or program material. Can not be combined with any other offer. Limit one coupon per order. Offer expires December 24, 2013 11:59pm (EDT). Please call 1-800-852-4216 for complete details. *Shipping promotion only applicable to the lower 48 states. Does not apply to HI, AK, US territories, or international orders. Not responsible for typographical, technical, or descriptive errors of products herein. Prices are subject to change. This entry was posted in Hyundai, Hyundai Accessory Store on December 18, 2013 by hasblog. 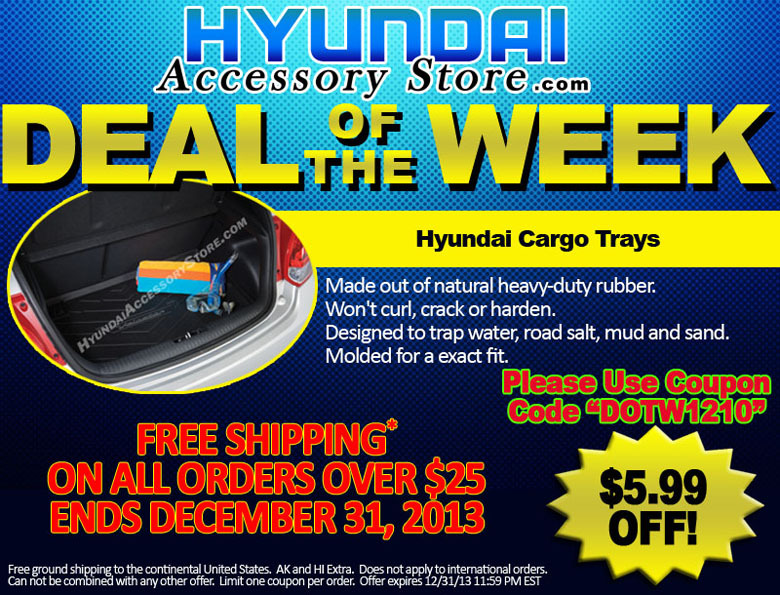 Keep the original carpeting of your Hyundai’s cargo area from wear and tear with these specially fitted Cargo Tray. Washable and durable, these tray will help your cargo area free from spills, dirt and other debris. Can not be combined with any other offer. Limit one coupon per order. 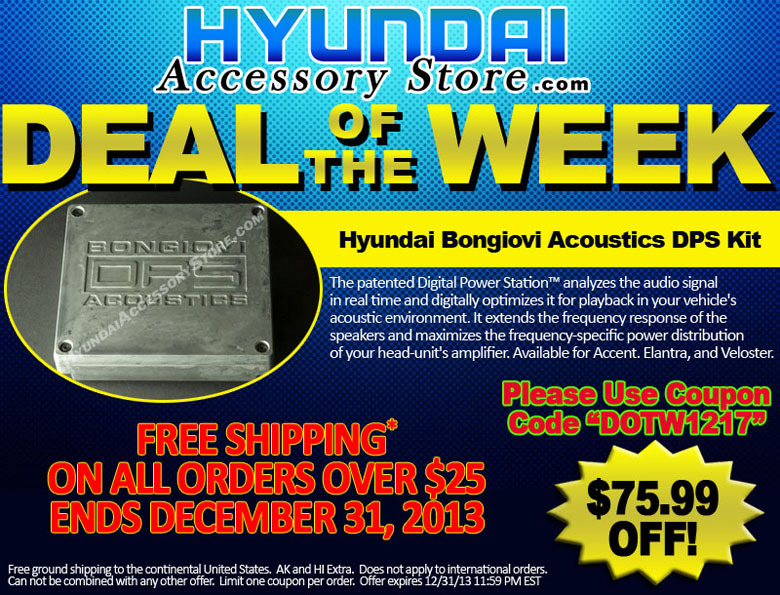 Offer expires December 17, 2013 11:59pm (EDT). Please call 1-800-852-4216 for complete details. This entry was posted in Hyundai, Hyundai Accessory Store on December 10, 2013 by hasblog. Floor mats are something you probably don’t think about very often. But if you consider the cost of replacement carpet for your car, floor mats suddenly become a fantastic value. Floor mats are required equipment when it comes to protecting your investment, especially if you live in an area that sees lots of winter weather. These rubber mats are made out of natural heavy-duty rubber and have molded channels designed to trap water, road salt, mud and sand. Made of pliable natural rubber, these mats won’t curl or harden in sub-zero weather. Molded for a exact fit. Can not be combined with any other offer. Limit one coupon per order. Offer expires December 31, 2013 11:59pm (EDT). Please call 1-800-852-4216 for complete details. This entry was posted in Hyundai, Hyundai Accessory Store on December 3, 2013 by hasblog.